Background: Known for their incredibly tough scales and extremely short tempers, the ancient race of Trogs has dogmatically served the Gorgons for centuries as the backbone of the Gorgon Army. General Krexx has proven himself time and again to be one of the toughest, meanest Trogs alive. Seeking out his lost Gorgon masters, Cobress and Viperia, General Krexx went through the portal, journeying across time and other mysterious realms to find them. Now safely on the other side, he desires nothing more than the satisfaction of serving his tyrannical Gorgon rulers. It’s only a matter of time for when the rest of the Gorgon Army follows their general through the Portal…the Seeker must be ready. Most Hated Hero: Lady Nimriel – In the time of Gorgons, Elves warred with the gorgons frequently. Lady Nimriel upholds the elven training used against Trogs in times of war. 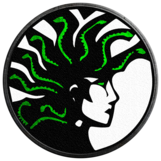 GORGON DEVOTION – Will revenge any attack dealt to a Gorgon. VENOM DEFENSE – Reduces damage taken per Venom debuff, chance to apply Venom to melee attackers. SUN-BATHED – Allied Reptiles cannot be Frozen. TAIL STRIKE – Melee Physical Attack on enemy that provokes and doubles the amount of Venom on the target. VENOM DEFENSE II – Reduces damage taken per Venom debuff, chance to apply Venom to melee attackers. VENOM DEFENSE III – Reduces damage taken from enemies per Venom debuff (on the attacker), chance to apply Venom to melee attackers. TROG SKIN – At the end of each turn, cleanse one debuff (from himself). [*] VENOM DEFENSE – Reduces damage taken per Venom debuff, chance to apply Venom to melee attackers. I don't understand Venom Defense. Reduces whose damage and per whose Venom debuff? Does that mean that damage taken by Krexx is reduced if he has a venom debuff or does it mean damage taken by Krexx is reduced if an enemy who is attacking him has a venom debuff? Seems like the latter, but just would like clarification as the wording is a bit ambiguous. Also, his first ascension gives him the "armored" trait, but isn't he already armored based on his base Tags? BTW, i think it is just like with Squinch, that the armored Tag can be gained due to evolution. So it wouldnt Be that new. The tags on top simply would show the tags for full ascension. I've rewritten that line to be more clear. Reduces damage done to him per venom debuff that exists on his attacker! That is, the more venom they got, the less damage they'll do to Krexx! He gets the armored trait upon first ascension! I'm a little old cat lady from Uttica. He radiates lasers from his mouth, scorching everyone in front of him. Just kidding, it's a basic swing attack. The Event splash says "Fear the combination of an all reptile team". 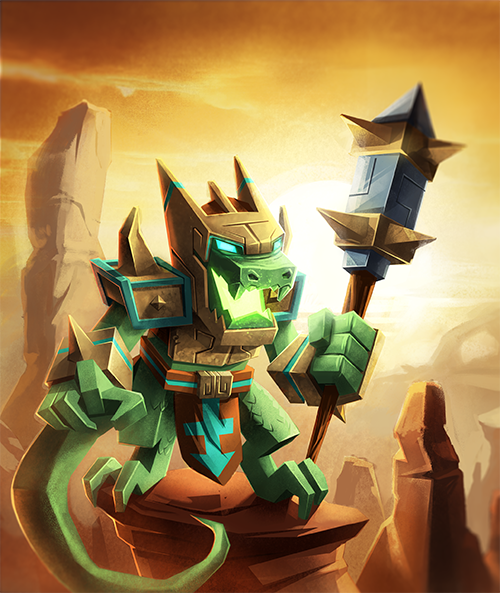 Is there a fourth reptile upcoming soon? someone didn't read post " It’s only a matter of time for when the rest of the Gorgon Army follows their general through the Portal…the Seeker must be ready." Just got a message on my phone and I'm here. Thank you to JackHallow666 for allowing me to use his amazing Kobal drawing as my profile picture! They asked if I cared. I said I did, I'm just really lazy. It’s only a matter of time for when the rest of the Gorgon Army follows their general through the Portal…the Seeker must be ready. Doesn't answer the "soon" question. So no quests to get more tokens for Kraxx? sort of disappointed with that. Even if it were only use him to gain more tokens. Seems like the normal Gorgon quests (mats, viperia and cobressa tokens). Still feel like a new hero release should be met with more fan fair, not as bad as wit the High King release but still, not close to what was done for Zomm, Malice, Hansuke, Zen, Hagrim, or Zen. It seems like Krexx is going to be an amazing tank! Now I feel like using the gorgon sisters more! will he be permanent in heroic? New heroes are never permanent in Heroic. Interesting that he doesn't do bonus damage to stoned targets like the rest of the reptile crew. I am confused. Is Krexx that new hero or is there another one coming up shortly after him? that was left from earlier today Removed! that's a Gorgon trait! He is not a Gorgon. But he can definitely help out in the venom dept! Just got him, seems pretty good. Favorite heroes: Overlord Executum, Hansuke Undying, and Augustus. i love his portrait doesnt it remind you of leonidus? The art is great. You can run into him in one of the reptile dungeons, and the animations are awesome, too. I wish I could afford to get him just for the coolness factor, but I'm still building. 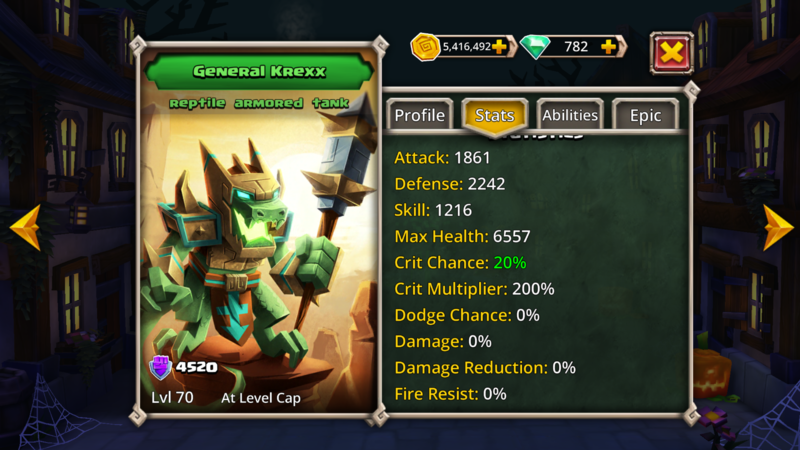 For us newbs who won't be taking him to level cap FA immediately, do we have level 1,unascended stats? I could calculate backwards, I guess. On the whole is very cool synergies with the other reptiles suggest to me that he won't be as valuable if you're not playing him with the other reptiles. Which I don't have. So I guess I'm still waiting for Igorok to return to the portal.